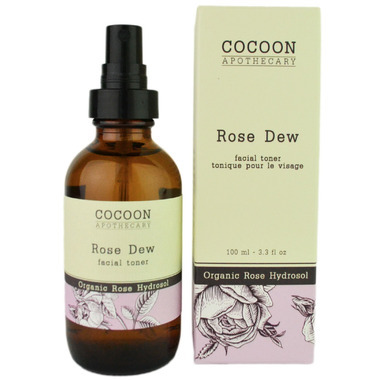 The Cocoon Apothecary Rose Dew Facial Toner is a refreshing 100% organic alcohol-free toner for normal, dry, mature, and sensitive skin that soothes and refines pores. Made with pure rose hydrosol from distilling rose petals, it reduces redness and cools skin while delivering nourishing botanical hydration. A gentle alcohol-free formula great for sensitive skin. Tightens pores and hydrates skin preparing it for moisturizer. Directions: Spritz on clean, dry skin and allow to dry OR spritz on cotton ball and apply to entire face. Follow with moisturizer. Ingredients: Certified organic rose hydrosol. I too have rosacea and incredibly sensitive skin. This toner is one of the few I've EVER tried that was gentle on my skin and didn't cause any issues. I will definitely be purchasing again! I would give this product more stars if I could. I have rosacea, and suffer from red, burning skin after exercise, or washing my face, or even just the heat of the summer. This spray has worked miracles - cooling my skin and reducing redness almost completely after use. I keep a bottle in my gym bag, makeup bag, and in the bathroom and will never be without. I really like this toner. Smells great, extremely gentle and moisturizing. I use this every night after cleansing my face. Such a lovely product, skin feels soft after application and looks so radiant when I wake up! !